I was listening to All Classical Portland the other day [April 2017] when they announced there would be a showing of the old time movie classic, "Song of Love", a film about three giants in classical music, Robert Schumann, Clara Wieck, and Johannes Brahms, and how their lives intertwined. This film from 1947, starring Katharine Hepburn, took place in Germany around the mid-19th century with the main theme revolving around the love and marriage of Robert Schumann to Clara Wieck, who would become Clara Schumann. These were two virtuoso pianists and composers who would come in contact and develop a friendship and mentoring with a young and upcoming virtuoso pianist, Johannes Brahms. 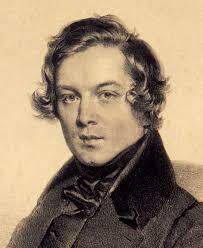 Brahms would also become one of the great Romantic Era composers, along with Robert and Clara. 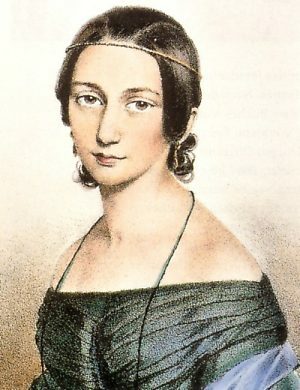 Besides a great love affair between Robert and Clara, was a tragic occurrence when Robert Schumann, feeling much pressure and failure [in his own mind] had a mental breakdown. This led Clara to forgo, what could have been an even greater amount, of composing great music, so that she could take care of her beloved Robert. Brahms, who became great friends with Robert and Clara, and who developed a great fondness [and later love] for Clara, also stood by his friend's side in his time of tragedy. Robert Schumann, sadly, could not overcome his mental problems and would go into an asylum, where he would be until his death. 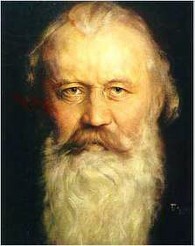 After Robert's death, Johannes Brahms would remain in great friendship and love with Clara. Robert Schumann and Johannes Brahms are considered two of the greatest composers in the Romantic Era of classical music, and Clara Schumann with some great compositions, especially for the piano, is certainly recognized as one of the best, if not the best, female composers of that era. All three had in their compositions some beautiful melodic and many times romantic themes. Listen to these piano concertos by each to hear the beautiful melodies and wonderful sound. Also, enjoy the ultra-emotional, Traumerei [from scenes from childhood], by Robert Schumann; the first movement, Allegro Moderato, of Clara Schumann's Piano Trio in G minor; and then the final two movements of Brahms epic Symphony #1 in C minor. Please turn up the volume and enjoy some beautiful music from these giants from the Romantic Era, Robert, Clara and Johannes.